Performance is a term used to describe the ability of an aircraft to accomplish certain things that make it useful for certain purposes. For example, the ability of an aircraft to land and take off in a very short distance is an important factor to the pilot who operates in and out of short, unimproved airfields. The ability to carry heavy loads, fly at high altitudes at fast speeds, and/or travel long distances is essential for the performance of airline and executive type aircraft. The primary factors most affected by performance are the takeoff and landing distance, rate of climb, ceiling, payload, range, speed, maneuverability, stability, and fuel economy. Some of these factors are often directly opposed: for example, high speed versus short landing distance, long range versus great payload, and high rate of climb versus fuel economy. It is the preeminence of one or more of these factors that dictates differences between aircraft and explains the high degree of specialization found in modern aircraft. The various items of aircraft performance result from the combination of aircraft and powerplant characteristics. The aerodynamic characteristics of the aircraft generally define the power and thrust requirements at various conditions of flight, while powerplant characteristics generally define the power and thrust available at various conditions of flight. The matching of the aerodynamic configuration with the powerplant is accomplished by the manufacturer to provide maximum performance at the specific design condition (e.g., range, endurance, and climb). All of the principal components of flight performance involve steady-state flight conditions and equilibrium of the aircraft. For the aircraft to remain in steady, level flight, equilibrium must be obtained by a lift equal to the aircraft weight and a powerplant thrust equal to the aircraft drag. Thus, the aircraft drag defines the thrust required to maintain steady, level flight. As presented in Chapter 4, Aerodynamics of Flight, all parts of an aircraft contribute to the drag, either induced (from lifting surfaces) or parasite drag. While parasite drag predominates at high speed, induced drag predominates at low speed. 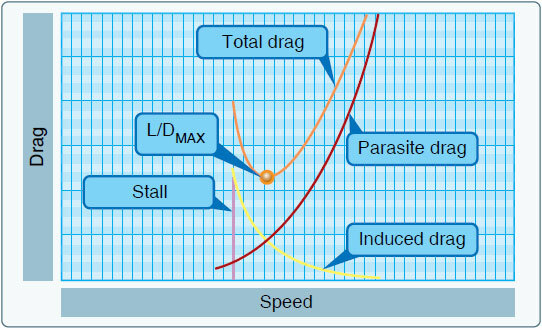 [Figure 11-5] For example, if an aircraft in a steady flight condition at 100 knots is then accelerated to 200 knots, the parasite drag becomes four times as great, but the power required to overcome that drag is eight times the original value. Conversely, when the aircraft is operated in steady, level flight at twice as great a speed, the induced drag is one-fourth the original value, and the power required to overcome that drag is only one-half the original value. Figure 11-5. Drag versus speed. When an aircraft is in steady, level flight, the condition of equilibrium must prevail. The unaccelerated condition of flight is achieved with the aircraft trimmed for lift equal to weight and the powerplant set for a thrust to equal the aircraft drag. The maximum level flight speed for the aircraft is obtained when the power or thrust required equals the maximum power or thrust available from the powerplant. 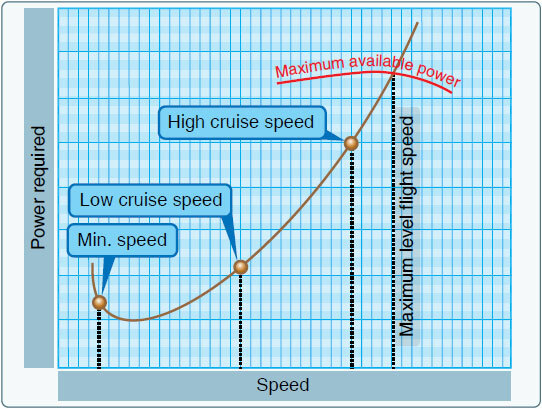 [Figure 11-6] The minimum level flight airspeed is not usually defined by thrust or power requirement since conditions of stall or stability and control problems generally predominate. Figure 11-6. Power versus speed.